So near – and yet so far. News that the Unite union has decided to suspend balloting its members on the offer that could hold the end to the over-a-year-old British Airways cabin crew dispute raises the issue of what exactly the offer is. Unite has decided to put off the ballot after reps at BASSA, one of the cabin crew branches, changed their collective mind and decided not to recommend accepting the offer – one of BA’s preconditions. “Any sense that this offer is being presented to cabin crew over the heads of unwilling representatives would be deeply damaging to the union,” said Unite joint general secretary Tony Woodley. It’s been nearly a month since BA chief executive Willie Walsh put his revised offer to Tony Woodley and Derek Simpson, Unite’s joint general secretaries, and Brendan Barber, the TUC general secretary who has been brokering negotiations. Well, for the first time in blogland, or anywhere public for that matter, I can release the full and unexpurgated details of the eight-page offer made on 15 October. I didn’t have the text of this offer when I wrote about it for Tribune recently, but thanks to recent help from the ever-faithful blog fan club, readers can decide for themselves what is at stake here. Read the offer in full below, or jump to my analysis. This position is a formal offer made by British Airways in a genuine attempt to resolve the dispute in the best interests of our customers and our cabin crew. We all agree that the airline needs to make permanent structural change to its cost base to ensure its long term survival. Both parties acknowledge that the company will only be able to afford this position if there is a stable industrial environment, without any further revenue loss or reputational damage as a result of industrial unrest. In doing so, the airline continues to recognise the professionalism and skill of its cabin crew. Incremental pay rises will be unaffected. The mixed flying fleet for new crew, with separate terms and conditions and bargaining rights will begin flying on 1 November 2010. There will be a separate negotiating body for the new fleet, which will not discuss the terms and conditions of current crew. To continue to demonstrate our commitment to our current crew and to address any rational concerns of introducing the new fleet, we are happy to continue to ffer the following assurances. Terms and conditions for current crew – A fundamental principle of this offer is that crew will have a firm commitment from British Airways in respect to their terms of employment. Current crew are assured that their existing contractual terms will be maintained for the future, unless amended through negotiation. Part-time – The company will continue to honour commitments to make part-time offers to all crew on existing lists. The offer will be on existing fleets, terms and conditions. Future opportunities will continue to be available. Access to route network – It is the company’s intention to deploy new aircraft based on commercial need cross existing and new fleets. New aircraft will be introduced on a fair and transparent basis across all the company’s fleets. Existing crew terms, conditions and fleet arrangements will apply when new aircraft are operated on existing fleets. As new aircraft are introduced across all the company’s fleets, crew will be trained in order to receive the necessary licenses as required by regulation. Career structure and opportunities for current crew – The career structure for current crew within current fleets will continue on the basis of existing practice, unless amended through negotiation. The company confirm that where there are opportunities available, existing crew will be promoted on existing terms and conditions on current fleets. Honouring current and future agreements – Both parties acknowledge the importance of honouring agreements and are committed to working with current arrangements. Ability to transfer fleet/base on current terms and conditions – As with the current process, there is no guarantee of achieving a transfer. However, the company has committed to continue with the current practice of transfers at Heathrow between Eurofleet and Worldwide, and to find a mechanism to aid limited transfers from Gatwick under current terms and conditions. Permanent variable pay top up – To provide increase assurance in relation to security of earnings, the company will introduce a permanent variable rate pay top up. For those Heathrow crew whose annual variable pay falls below the average earnings for their grade and fleet in 2009/10, the company will pay a top up lump sum every year after the launch of the new fleet. The amount to be topped up will be the difference between the variable earnings achieved by the crew member and the average amount for the grade and fleet, if there is a shortfall. The average variable pay for grade and fleet will include variable pay elements listed in appendix I. Adjustments will be made for non flying time, including unpaid leave, sickness, line trainer duties and TU duties and activities. The payment will be pro-rated for part-time crew. The payment would not be made to those crew who participate in industrial action in the year the action took place. The top-up year runs from 1st November to 31st October. All current crew will have the opportunity to apply for all roles on the new fleet if they choose. This will provide promotion opportunities for many current crew. All crew joining the new fleet will have separate terms and conditions. It is accepted that restrictions within the Gatwick Fleet memorandum of agreement limit the long-haul route network. It is agreed that discussions will be held with a view to removing these restrictions to provide the best opportunities for growth in the long haul network at Gatwick, for the benefit of the business and our people. The definition of disruption and its scope remains unchanged, except as identified below. The parties are committed to beginning the process of restoring and improving relationships at all levels. With this in mind, it is important that there is no victimisation arising from the dispute and both parties will work to ensure that any issues are settled in a mature and professional way. Where there are disciplinary or grievance cases, the intention is that these will be resolved quickly. Where behaviour is found to be serious, any resulting action will be measured and proportionate. Unite and British Airways agree that if any employee who has been subject to disciplinary action (in connection with the current dispute by British Airways and whose name appears in the confidential annex to this agreement (a ‘Relevant Employee’) decides to bring an Employment Tribunal claim for unfair dismissal, then as an alternative to Employment Tribunal litigation, that claim will ordinarily be dealt with under the Acas arbitration scheme for the resolution of unfair dismissal disputes. British Airways and Unite agree that the Arbitrator’s decision will be binding and before entering into the Acas arbitration scheme they will enter into an agreement to this effect, to which the Relevant Employee will also be a party. Any arbitration hearing will take place only after British Airways’ internal appeals procedure has been exhausted. In any case British Airways [will reserve?] the right to approve or reject the arbitrator proposed. Where a Relevant Employee refuses to agree to the use of the Acas arbitration scheme, or initiates any legal action whatsoever connected [with a?] disciplinary case which is not within the ambit of the Acas arbitration scheme, Unite will withdraw all direct and /or indirect support and [assistance?] to that Relevant Employee, including any legal support, [?] and permanently. An Acas review of all dispute related disciplinary cases that have been dealt with under British Airways’ disciplinary procedures will also be conducted. British Airways is committed to giving full and fair consideration to any Acas recommendation arising from that review. Nothing in this section will be taken or cited as a precedent for any past or future cases. It is acknowledged that the existing arrangements for industrial relations for cabin crew need to be reviewed and made fit for purpose, for both the company and the union in the 21st century. Both parties are jointly committed to a comprehensive review of industrial relations between BA and Unite-representing cabin crew to be undertaken by a mutually acceptable third party supported by Acas with a view to them making recommendations that both parties will accept as binding. The union will re-engage with the existing facilities agreement. Negotiations will take place between the company and the cabin crew union national officers, with a view to reaching a mutually agreeable framework within 8 weeks of signing this agreement. As part of this agreement, the company intends to introduce a new Cabin Crew Union facilities agreement that includes time off for trade union duties and activities. If we cannot reach agreement on a new Cabin Crew Union facilities agreement within the next 8 weeks, then the company will serve notice on all of the existing facilities agreements, but will continue to comply with its statutory obligations.. The company proposes the introduction of a broader business consultative approach across British Airways, to engage our representatives and our managers in a wider debate about our business performance and needs of our customers. An example of items for discussion at the forum is the allocation of routes. Prior to the start of each season the company will discuss the allocation of routes with Unite. Both parties are firmly committed to the effective application of company procedures, which are currently the subject of negotiations in the Employment Policy Committee and BA Forum. Changes to corporate policies that apply to colleagues across the company and covered at the BA Forum and EPC have been subject to discussion [with?] the intention to conclude these discussion within eight weeks of [completing?] this offer. This revised formal offer maintains the contractual rights of cabin crew at their current level. The offer does not reduce or extend them from where they are today. Both parties recognise the assistance the TUC has given in securing this agreement. The application of this agreement will be reviewed annually with the TUC, at twelve, twenty-four and thirty-six months from the date the agreement is signed. If either party believes that this agreement is not being honoured a meeting at Director/General Secretary level (or their nominated replacements) can be convened. The objective of the crew top up scheme is to provide greater security of variable earnings for current crew in Heathrow Worldwide and Heathrow Eurofleet. It is designed to mitigate the concerns over the pace and mix of work transfer to the new ‘Mixed Fleet’. All existing variable pay will continue to be paid as now e.g. all box payments, all back to backs, destination payments, excess time premiums, short turnaround payments etc. The crew variable top up scheme means that everyone at Heathrow will be paid at least the average amount of variable pay that was earned by their grade and fleet during the 2009-10 schedule, regardless of their roster. If crew were to earn less than this, the difference will be topped up to the amounts shown below on an annual basis. The minimum amount of variable pay shown below would be increased in line with any base pay uplift that is applied. Part time crew will receive a pro rata amount of the above sums. As now variable pay flying allowances will not be paid when you carry out non flying duties. A daily amount (1/365 of the full time amount shown) will be deducted from the annual minimum variable pay for each non flying day from the following list. This is crucial. When Walsh stripped striking crew of their travel concessions, Unite cried foul. Cabin crew have previously said that these concessionary rates, sometimes labelled ‘perks’, are absolutely essential for doing their job, as they often need to fly – sometimes internationally – from their current resting place to the airport to join the plane. Without them, they say, they can’t afford to work. Walsh is prepared to restore concessions to staff who’ve been on strike, but not “seniority” – the system by which cabin crew move up the queue for concessions based on length of service. So a crew member with 20 years’ service would go back to zero seniority. And before the concessions are restored, there must be a period without industrial action. Walsh also says (though again, this isn’t in the agreement text) that “a key element of the agreement is the need for both parties to conduct industrial relations differently from today.” He explains: “Communications issued by Unite and its branches must be more balanced and measured than they have been. The company will continue to ensure that its communications are balanced and objective”. In other words, he says it’s Unite that has been presenting an inappropriate view of the dispute, not BA. One imagines Walsh has Unite’s “Brutish Airways” campaign website in mind – perhaps they’ll be obliged to take it down to comply with the agreement? Walsh is clearly seeking to place some blame with Unite. Bassa officials are reported to be unhappy at the implications of cabin crew “initiating any legal action” relating to disciplinary cases connected to the dispute. A number of cabin crew have lost pay during the dispute, but insist they were genuinely off sick. The agreement would strip them of union support if they took legal action through an employment tribunal, and require them to go down the Acas route instead. Current legal action must also be dropped. Some obviously take the view that’s not good enough. Heathrow-based cabin crew will also be denied the “permanent variable pay top up”, which is worth up to nearly £8,000, if they were on strike this year. BA is generally working towards removing union restrictions on how it does business – for example, by demanding a review of the routes it can fly out of Gatwick (which was less affected by the strikes than Heathrow). Use of BA facilities by union officials will also be re-examined, with the threat of BA withdrawing all support if no agreement is reached within eight weeks. 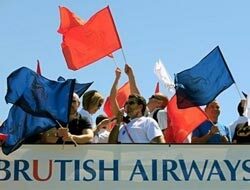 However, the airline does recognise that union lay officials working for BA need time off for union activities. Duncan Holley, Bassa’s branch secretary, says he was sacked by BA for seeking to use his time off in this way. This offer has clearly proved divisive among cabin crew and Unite reps. Some, it has emerged, think it no better than the last offer and see it as a punishment for those who took lawful industrial action. Others however may be ready to sign it. What the membership as a whole thinks remains to be seen. This entry was posted on Friday 12 November 2010 at 4:00 and is filed under Unions. You can follow any responses to this entry through the RSS 2.0 feed. You can leave a response, or trackback from your own site. Vielen Dank f�r die Informationen. Sehr sehr hilfreich f�r einen Pharmaziestudenten wie mich. Komme wieder – weiter so!